I have recently taken up gardening. That is a sentence I never thought I would write. Yet, here we are, and so far I am enjoying it immensely. My Italian flat-leaf parsley in particular is going great guns. The picture above may not look as impressive as other, larger members of the foliage kingdom, such as lavender bushes or small shrubs. 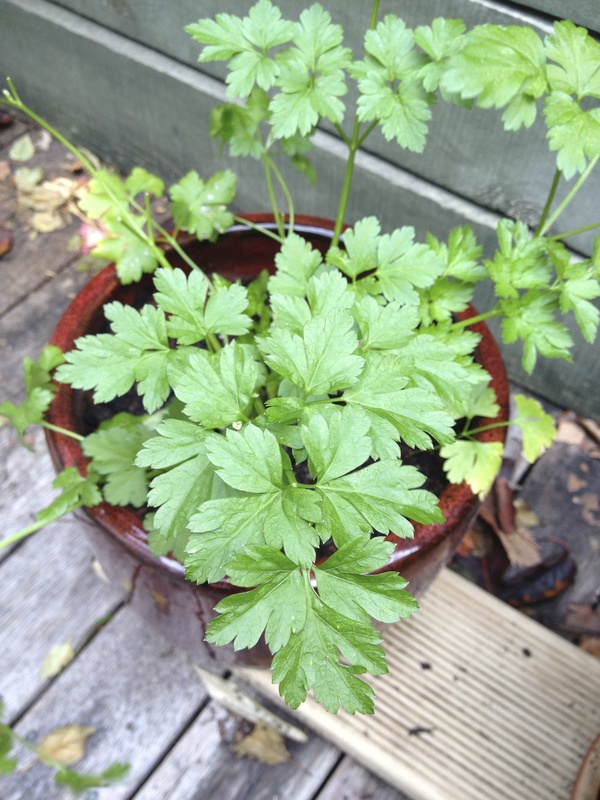 But given I have never been able to keep even a pot plant alive (ask my mum), the fact that my parsley is springing forth in several locations in my garden is very, very exciting. 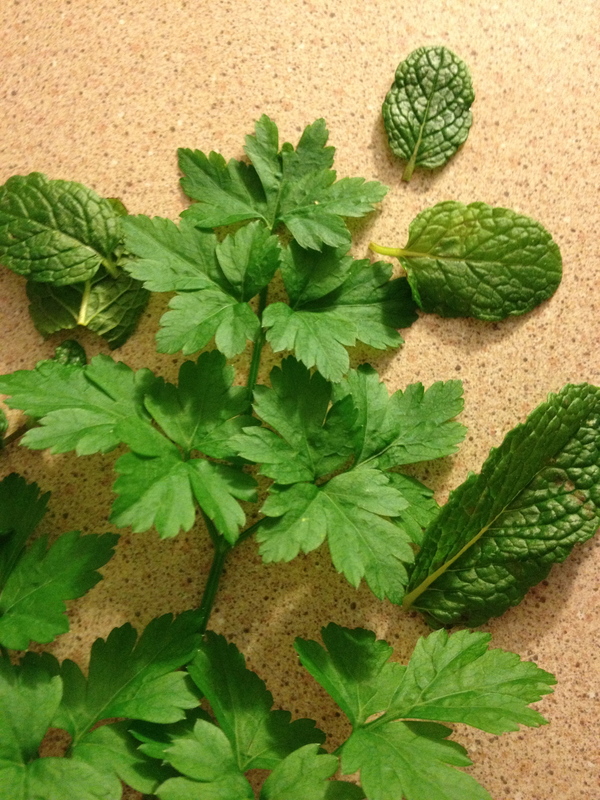 So, now that my parsley is healthful, if not quite yet in abundance, I am lead to the question of what to do with it. A quick google leads me to some interesting facts about parsley. According to legend, parsley is dedicated to Persiphone and will only grow once the seed has visited Hades seven times. I hope this does not mean there is some kind of fast-track between Hades and my garden. It is also said that parsley will only grow well where a strong woman dwells. But of course. This is all very interesting but does not answer the question to hand of how I want to eat this stuff. 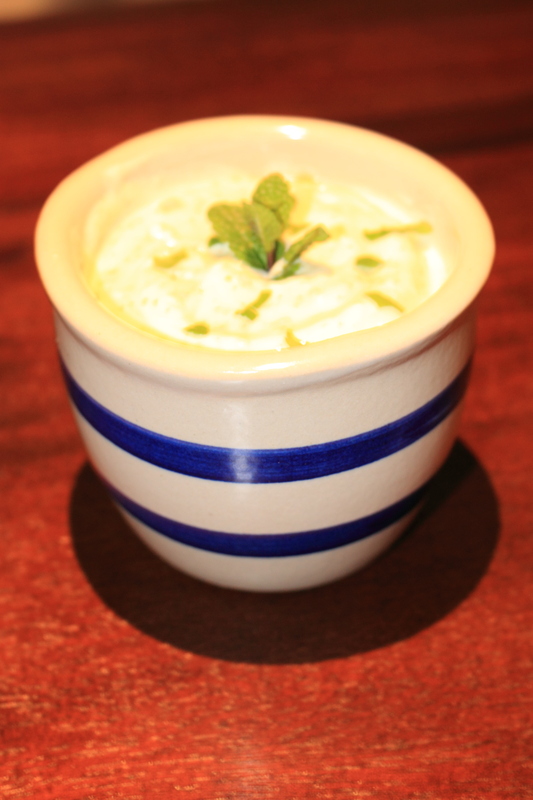 So, left to my own devices, I have come up with this recipe for Parsley and Mint Yoghurt Sauce. 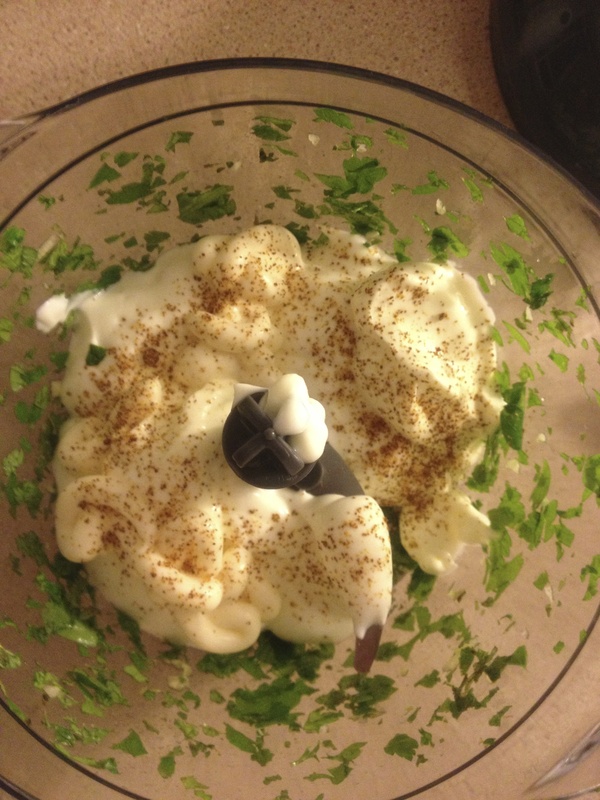 One tablespoon of sour cream. Crush and dice the garlic, and loosely tear up the parsley and mint. If you have one of those little whizzy-chopper things, great. A food processor would work too. Put the herbs and garlic in the bowl and whizz them up a little. Without electrical intervention, I think slicing, dicing and mixing by hand would do the trick. Add the yoghurt, sour cream and cayenne. 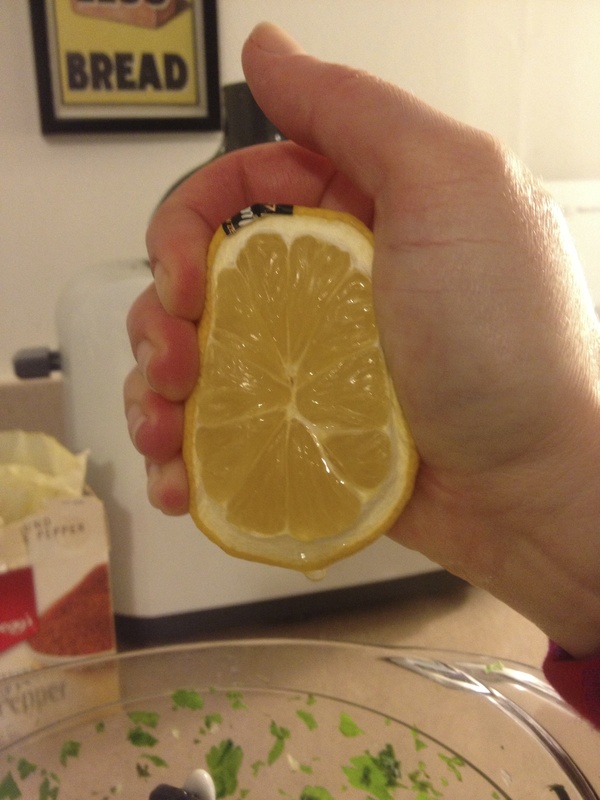 Squeeze in the juice from the lemon half. Whizz it up again until it is as smooth as you like. The Mr gave me a hand photographing the sauce,both by itself and atop of dinner. We had to confess it does not look amazingly appetising either tout seul or in the company of dinner, resembling somewhat the great green glob from outerspace (or Hades, I suppose, if you follow the aforementioned legend). 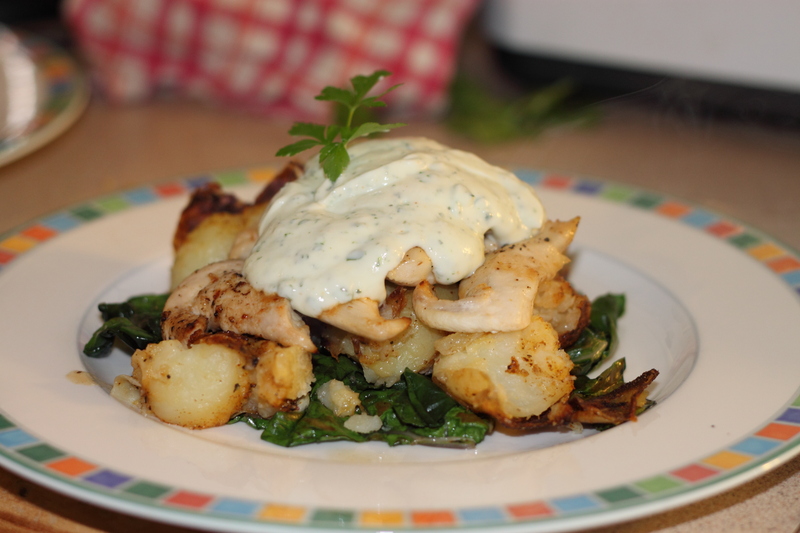 Let me assure you however, the taste is quite lovely and made a good accompaniment to our meal – I served it slathered on top of potatoes roasted with their skins on, in paprika, olive oil and black pepper; chicken breast grilled in lemon juice, and a little stir-fried silver beet. I have a little left over, and can confirm it also works well as a dip with carrot sticks. As my parsley shows no signs of slowing down, I will be making this again. Crush and dice the garlic, and loosely tear up the parsley and mint. Add herbs and garlic to the bowl of whizzy-chopper thing or food processor and blend until finely chopped. If doing by hand, slice the herbs more finely than loosely tearing, add to a bowl and mix. Ooh! You’re on! Got me thinking already. Very pleased to hear about the continued health and vigour of your mint and parsley. Yummy! Also pleased on your behalf to hear of the end of Winter! Ha ha, I know! Hadn’t thought about it for years, and suddenly it’s pesto that triggers the memory!